The United States Congress designated the Nunivak Wilderness (map) in 1980 and it now has a total of 600,000 acres. All of this wilderness is located in Alaska and is managed by the Fish and Wildlife Service. Off the coast of the delta formed by the Yukon and Kuskokwim Rivers lies Nunivak Island, managed as part of the Yukon Delta National Wildlife Refuge. The southern half of Nunivak comprises the Nunivak Wilderness. Lava flows and craters found in the interior of the island, some of which hold deep lakes, attest to its volcanic origin. An extensive upland plateau stands 500 to 800 feet above sea level and supports a large herd of reindeer. Introduced in 1920, the herd now numbers over 4,000 individuals. The Eskimos of the village of Mekoryuk, the only community on the island, own and manage the reindeer. More than 40 rivers combine to drain the upland. Tundra, which dominates the landscape, gives way to rocky shores and saltwater lagoons filled with eelgrass (feed for migratory waterfowl) and backed by sand dunes. Isolated low mountains and buttes break the tundra. Vast seabird colonies nest on cliffs along the shoreline, and a large variety of migratory birds flock here in season. Sea mammals frequent the coastal region. Nunivak Wilderness is probably best known for its herd of great shaggy musk oxen. 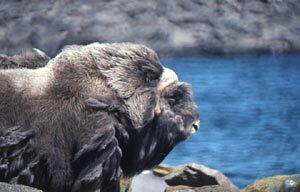 While the Alaskan musk ox became extinct around 1865, these were introduced here from Greenland in 1935. The herd flourished, growing to more than 750 members, and some were shipped to other regions of Alaska. Each year, a permit system determines which hunters will get to shoot a few of the musk oxen, the chance of a lifetime for many. Nunivak Wilderness receives 18.6 inches of precipitation each year. The warmest temperature come in July and average between 49 F and 63 F. The coldest temperatures come in January and average between 1 F and 13 F.
Planning to Visit the Nunivak Wilderness? How to follow the seven standard Leave No Trace principles differs in different parts of the country (desert vs. Rocky Mountains). Click on any of the principles listed below to learn more about how they apply in the Nunivak Wilderness.